In July 2017, Greg Biffle was first accused by his ex-wife and former mother in law of placing hidden cameras inside his residence. Nicole Lunders, formerly known as Nicole Biffle and her mother in law have opened a civil case against the former NASCAR driver. They allege those cameras were placed in bedrooms and bathrooms inside the home owned by 48-year-old Greg Biffle. At least one of those cameras claim to have been placed in the bedroom that was used by the mother in law. The cameras were installed in Biffle’s Lake Norman home. Biffle claims the cameras were installed solely for the purpose of security. There’s nothing illegal about installing cameras for security purposes inside your own home. However, the Lunders family claims Greg Biffle showed video footage to other people. Footage that featured Nicole Lunders and her mother in law. The cameras were installed by a Roush Fenway Racing employee, Ricky Mattew Reavis. Biffle formerly drove for Roush Fenway Racing in the NASCAR Cup Series for the entirety of his 15 year racing career. The RFR employee who installed the camera system also took the stand on Monday. He claimed that Biffle wanted the cameras installed because Biffle was under the impression that someone was stealing from him. However, he also claimed that Biffle also told him to install certain cameras when his wife wasn’t home. The RFR employee stated that he felt uncomfortable when given the task to install secret cameras in a separate home. Those cameras would be installed where his wife would be watching their child. Ricky Mattew Reavis, the Foush Fenway Racing employee who installed the cameras was initially listed on the lawsuit. However, he has since been removed, per a request of the judge. Though, he remains as a witness in the case. Greg Biffle took the stand yesterday at the Uptown Charlotte North Carolina courthouse in the first day of the trial. The first day of trial was brief. The hearing resumes today in Charlotte, North Carolina. Greg Biffle is a former NASCAR champion, winning the NASCAR Busch Series title in 2002. He picked up 19 NASCAR Cup Series race wins in his 15 year career. Additionally, he picked up 20 wins in the NASCAR Xfinity Series and 16 more in the NASCAR Truck Series. Biffle drove for Roush Fenway Racing for the duration of his NASCAR Cup Series career. He was forced into early retirement following the 2016 season as he failed to find a new ride after his contract expired. 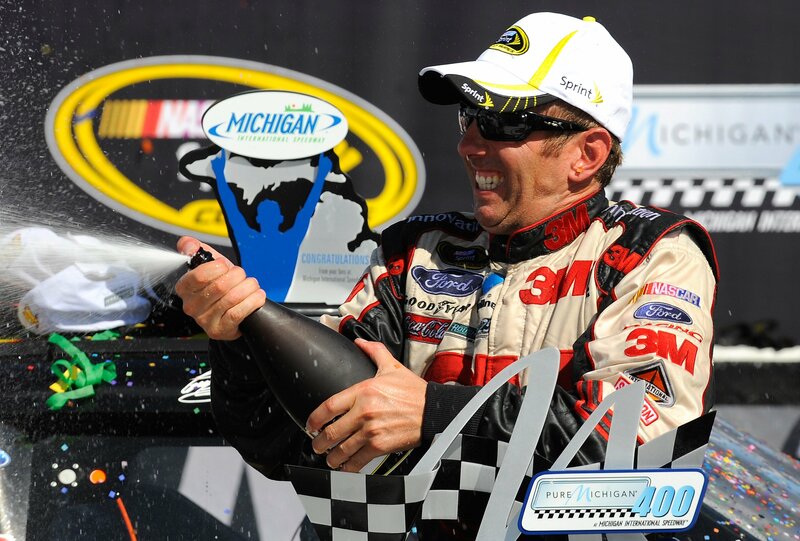 Biffle’s last NASCAR Cup Series win came on August 19th, 2012. He picked up that win at Michigan International Speedway. Here’s what we learned from the hearing on Tuesday at the Mecklenburg County courthouse in uptown Charlotte, North Carolina. The lawsuit is based on emotional distress. Lunders claims she suffered stress due to the footage of bedroom and bathroom cameras. She’s concerned that the footage was shown to other people. Lunders attorney claimed that the cameras were installed with the attempt to catch her in an affair. Meanwhile, the ex-wife of Greg Biffle admitted to having affairs. However, she suggested Greg Biffle engaged in affairs as well. A claim the former NASCAR driver denied. Biffle’s public image was brought into the courtroom on Tuesday. While on the stand, Biffle was asked if losing the lawsuit would negatively affect his chances of getting into the NASCAR Hall of Fame which sits just a few blocks from the court house. “I didn’t do anything inappropriate,” Biffle responded. The ex-wife and her mother in law are seeking damages of around $100,000. In initially report filings the plaintiff listed a minimum amount of $25,000.